You can access any module directly from your application code by creating an internal link to that module. An internal link is like a link callback—it lets you specify the module type, a setup function, and, where appropriate, a location. But unlike a link callback, which is always associated directly with a widget callback, an internal link has no association with any widget. Instead, PhAB will generate a manifest that you use in your application code to specify which internal link you want to use. PhAB provides several functions to help you use internal links (discussed below). Create a PhAB module within application code. Using a link callback, you can directly link a widget to a PhAB application module. But sometimes you need to create the module from your application code instead. To do that, use an internal link. when you want to display a menu when the user presses the right mouse button. Access and display picture modules. You use picture modules primarily to replace the contents of existing container widgets, such as PtWindow or PtPanelGroup. Note that when you create a picture module using ApCreateModule(), you must specify the parent container widget. Click on the <NEW> option if it isn't already selected. Choose the type of module you want. Fill in the fields in the Module Link Info section — see below. Click on Apply, then click on Done. If the module you specified in the Name field doesn't exist, PhAB will ask whether it should create that module. 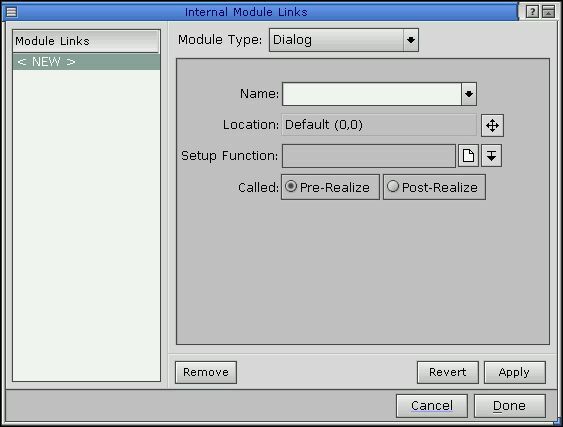 You can create only one internal link per module. Name—Contains the name of the module. To select from a list of existing modules, click on the icon next to this field. Location—Determines where the module will appear; see “Positioning a module” in the Working with Modules chapter. Setup Function—Specifies the function that will be called when the module is realized (optional). To edit the function, click on the icon next to this field. For more information, see “Module setup functions” in the Working with Code chapter. Called—Determines whether the setup function is called before the module is realized, after the module is realized, or both. Reset—Restores the internal link information to its original state. Remove—Deletes the selected internal link from the Module Links list. For every internal link defined in your application, PhAB generates a manifest so you can identify and access the link. Since PhAB derives the manifest name from the module name, each module can have only one internal link. This may appear limiting, but PhAB provides module-related functions (see below) that let you customize a module's setup function and location from within your application code. To create the manifest name, PhAB takes the module's name and adds ABM_ as a prefix. So, for example, if you create an internal link to a module named mydialog, PhAB creates the manifest ABM_mydialog. Lets you manually create modules designed within PhAB. A module created with this function behaves exactly as if it were linked directly with a link callback. For example, if you define a location and a setup function for the internal link, the module will appear at that location and the setup function will be called. Furthermore, widget callbacks, hotkeys, and so on will become active. Lets you change the setup function associated with an internal link. Lets you change the display location associated with an internal link. Lets you change the parent of a window or dialog module associated with an internal link. This function applies only to internal links for window and dialog modules. Lets you open the module associated with an internal link as a widget database. For more info on the above functions, see the Photon Library Reference . 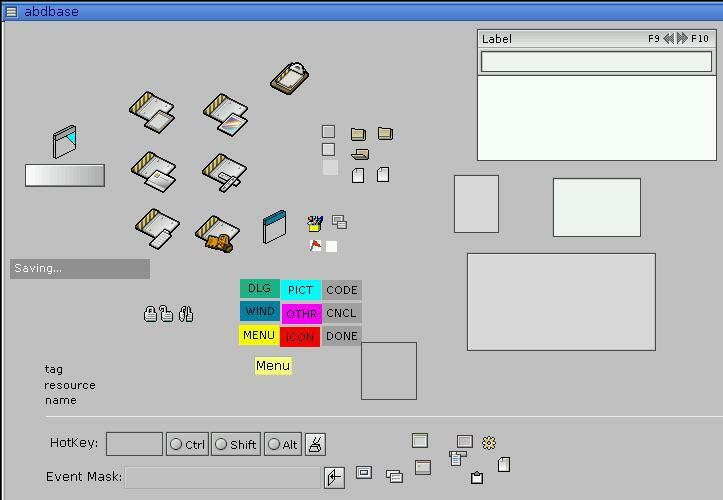 In PhAB, create the menu module. Give it a name, such as my_menu. Create an internal link to the menu module, as described above. For a popup menu, you'll usually want the module to be positioned relative to the widget or relative to the pointer. Select the widget to be associated with the menu. Make sure it has Pt_MENUABLE set and Pt_ALL_BUTTONS cleared in its Pt_ARG_FLAGS. Generate the code for your application. PhAB creates a manifest for the internal link. In this example, it's called ABM_my_menu. The widget passed to ApCreateModule() is used if the menu is to be positioned relative to the widget; the cbinfo argument is used if the menu is to be positioned relative to the pointer. Compile, link, and run your application. When you press the right mouse button over the widget, your menu should appear. to serve as widget databases. If you plan to use a widget several times within your application, a widget database lets you design the widget just once. It also saves you from a lot of coding. All you have to do is preset the widget's resources and then, using PhAB's widget-database API functions, create a copy of the widget wherever you'd normally create the widget within your code. Widget database used for PhAB's interface. Create a picture module within your application. Create an internal link to the picture module. Create the widgets that you'll need to access in your application code. For example, let's say you need to create a certain icon many times in your application. By creating the icon inside the picture module, you can create as many copies of the icon as you need at run time. Besides being able to preset all of a widget's resources in the database module, you can also preattach its callbacks. When you create the widget dynamically, any callbacks you attached will also be created. By presetting the resources and callbacks of a database widget, you can easily reduce the code required to dynamically create the widget to a single line. Preattached callbacks work only with modules and functions that are part of your executable. If your application opens an external file as a widget database, the PhAB library won't be able to find the code to attach to the callback. Assign each widget in a widget database an instance name—this lets you refer to the widgets when using database-related API functions. You can also create a widget database that you can change dynamically. To do this, open an external widget database—that is, one that isn't bound into your executable—with ApOpenDBaseFile() instead of ApOpenDBase(). ApOpenDBaseFile() lets you access a module file directly and open it as a database. Once you've opened the module file, you can copy the widgets from that file to your application's internal database and save the resulting database to a new file that you can reopen later. PhAB provides several support functions to let you open a widget database and copy its widgets into modules—you can copy the widgets as often as needed. PhAB also provides convenience functions to let you copy widgets between databases, create widgets, delete widgets, and save widget databases. These let you open and close a widget database. To ensure that the database is always available, you typically use ApOpenDBase() in the application's initialization function. These let you open and save external module files as databases within your application. This function lets you indicate which widget classes you're likely to encounter when you call ApOpenDBaseFile(). When you link your application, only those widgets it needs are linked into it. If you access widgets that aren't in your application because they're in an external database, you must add them to your internal class table so that they can be linked in at compile time. These create widgets from the widget database. ApCreateWidget() and ApCreateDBWidget() create a single widget only, regardless of the widget's class. For a noncontainer-class widget, ApCreateWidgetFamily() and ApCreateDBWidgetFamily() create a single widget; for a container-class widget, they create all the widgets within the container. ApCreateDBWidget() and ApCreateDBWidgetFamily() include a parent argument; if this is NULL, the widget has no parent. ApCreateWidget() and ApCreateWidgetFamily() put the new widget(s) in the current parent. To make sure the correct widget is the current parent, call PtSetParentWidget() before calling either of these functions. Don't use the manifests generated for the widget database's picture module. Instead, use the widget pointers returned by ApCreateWidget() or ApCreateDBWidget(). Lets you copy a widget from one widget database to another. Typically, you use this only when you're dynamically creating and saving widget databases within your application. Deletes a widget from a widget database. Gets information about a widget in a widget database, including its name, class, parent, and level in the hierarchy. Pull out image-resource data from a widget and use this data to set resources of a widget already displayed in your application. This function lets you achieve very basic animation. If you use a widget database to create widgets that have PhImage_t data attached to them, don't close the database with ApCloseDBase() until after those widgets are destroyed. (Closing the database frees the memory used by the image.) If you must close the database, make sure to copy the image data within your application code and to reset the image data resource to point to your new copy. For more information, see the “Animation” section in the chapter on Drawing. This lets you extract text strings from a widget database. It's useful for multilingual applications, as the text is automatically translated if the language support is enabled. For more information, see the International Language Support chapter. Remove a widget class. If you've loaded a DLL that defines widget classes, you should remove them before unloading the DLL. For more information, see “Making a DLL out of a PhAB application” in the Generating, Compiling, and Running Code chapter. For more info on widget database functions, see the Photon Library Reference .